Reviews.com has created a guide to review the best scholarship search platforms and instruct students on how to use them effectively to find as many opportunities as possible. ScholarSnapp is a search platform that has partnered with the Common App to allow a student's Common App information to transfer to their Scholar Snapp profile. 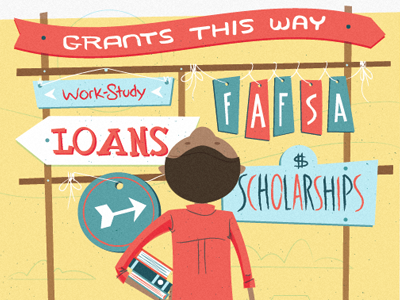 The goal of these two organizations is to make the scholarship process easier. Regardless of the search platform you choose, the author of "A Comprehensive Review of the Leading Scholarship Search Services," shares a conclusion about the search platforms they reviewed that can be generalized to many of the scholarship searches available to students. They say that, "not any one of them is able to give a complete and concise scholarship list and results lists differ widely. There are anomalies, mismatched data, and their systems are human-driven, which means there could be outdated and inaccurate information. The scholarship data itself is categorized completely differently from one to the other, and in almost all of them, it’s clear that advertisers figure prominently. Users may maximize the scholarship data and subscribe to more than one. A new email account specifically for use during college and scholarship searches would effectively keep spam and junk out of a personal email account." Watch a slideshow which covers basic information regarding financing a college education. It was created by the Educational Credit Management Corporation (ECMC). WUE is a program that allows Oregon high-school students to request reduced tuition at participating two- and four-year public college programs outside of Oregon. Go to http://www.wiche.edu/wue to see a list of participating WUE schools, and learn how to apply for this tuition-reduction program. The reduced tuition rate is not automatically awarded, and many institutions limit the number of new WUE awards each academic year, so apply early! DREAMers Scholarships (These scholarships are only available for attendance at a very limited number of colleges).